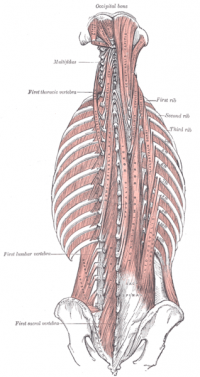 The spinalis is just next to the spine, and to work on this muscle fingertips or thumbs can be used easily. The longissimus forms the main meat of the erector group, and is palpated as a taught rope half an inch lateral to the spine. The attachment of the iliocostalis is to the ilium and ribs. Because of it's lateral position, a tight iliocostalis can bring a hip up, or bring the ribcage down toward the hip. Each of these have 3 parts further.